Matchday was discontinued in December 2015. 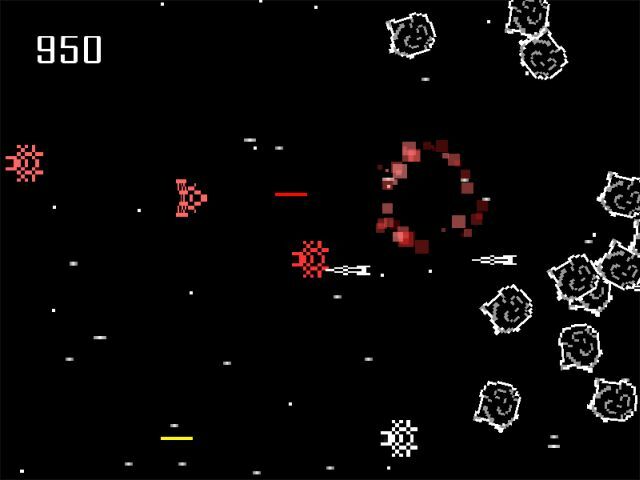 Rex is a side-scrolling arcade shooter with a retro feeling. 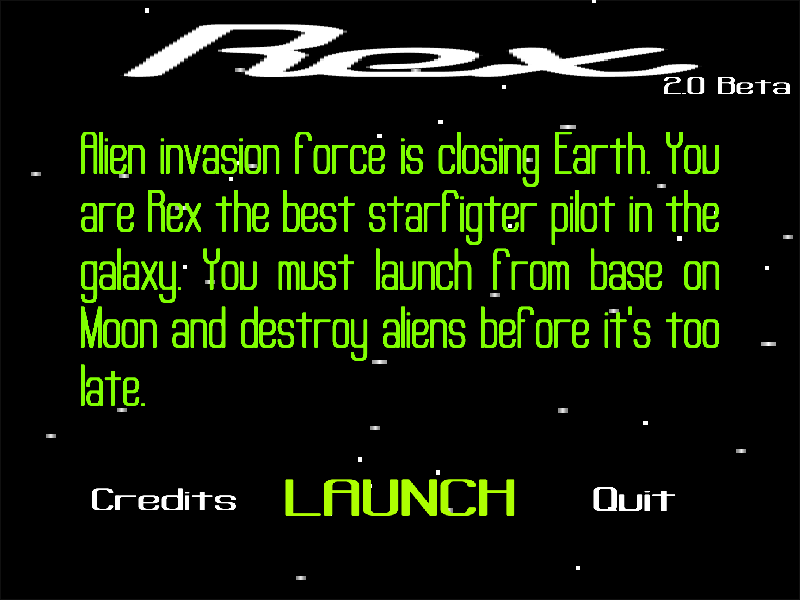 You are Rex the best starfighter pilot in the galaxy and your mission is to blast through waves of alien invaders. Rex is my first try with Torque Game Builder and is made almost entirely with TGB behaviours. When I was about ten years old, I found that my father’s computer came with GW-BASIC. I immediately thought that it would be great if I could make games with it. After getting some programming books from a local library, I took the firsts steps on the path of a programmer. Next enter the graphics. I figured out how to convert pictures made with Dr Halo III to format usable from Basic. This lead to the inception of the Death Boxing a simple button masher beat-’em-up with toilette humour. At this point, the programming environment has upgraded to QBasic with similar interface as the legendary DOS’ edit. My programming skills were not on par with the ideas and many projects stayed only planning stage with some demos screens drawn. I remember at least planning and RPG epic Secret of Blue Illusion with my school mates and Micom the Space Guy – a comic hero invented by my brother – adventure. I also tinkered a bit with the 3D Construction Kit and made RuneQuest character generator with Visual Basic. I planned to make tile based RPG with Visual Basic, but only ended up with some UI mock-ups and tile graphics. There was also some adventure creation tool in the spirit of the Adventure Game Studio, but I can’t recall the name of the program. In the mid-nineties, I had learned that the C++ was the language for game programming. I managed to acquire a copy of Borland’s TurboC and learnt C++ programming from articles in MikroBitti magazine. I also studied some Pascal at school, but I was disappointed because C++ was not taught. Later we made extremely 90’s web pages for our boy scouts group. Let them be wiped off the face of the Internet. Cave-flyers like TurboRaketti and Auts were popular at the time, and I bragged to my friend that it would be fairly easy to make one. So I made Zappo Fighter. 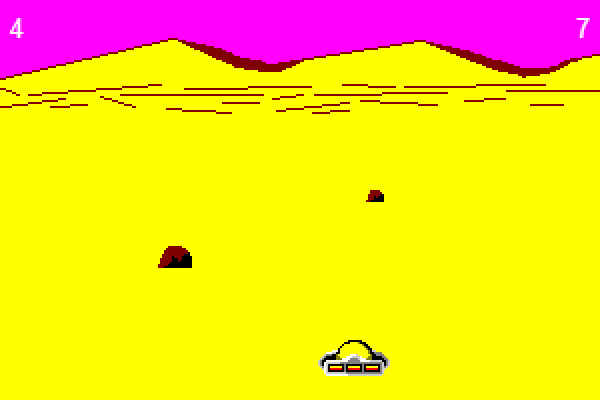 The game featured only one level but had a destructible terrain and a secondary weapon which would freeze the enemy for a short time. Later I started to make a sequel with DJGPP and Allegro game programming library. 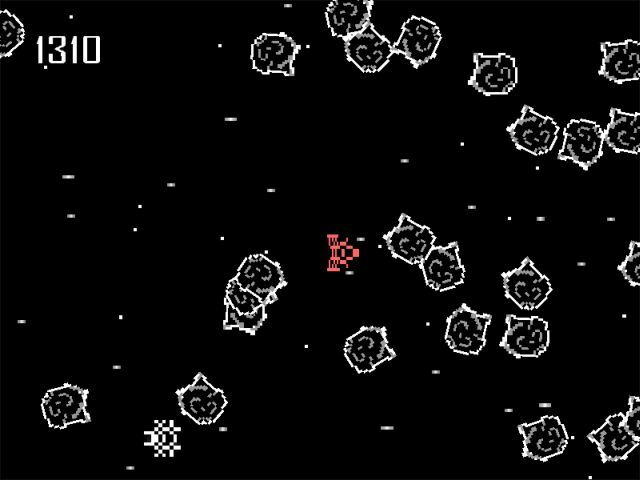 It only got as far with two ships shooting each other on one screen without any terrain, but the other ship had homing missiles as a weapon. The Allegro library was fun to use, and I coded a tile map editor based on the Allegro’s user interface components and data files. I spent most of the 2000’s studying computer science at the University of Turku. Java was the teaching language in most of the courses, so I mostly gave up programming with C++. During my time at the university, game development studies started appearing in the curriculum, and I tried to attend most of them. I did not do much hobby projects at the time but tried to make games as exercise projects when possible. The first game was a simple text based Poker, which I made with three friends. The game was without much of a real use, had over 200 pages of documentation. Then we had to return exercise reports on paper. Javadocs and code were required as appendixes, so the report became quite bloated. Next project was a networked artillery game Tykkipeli, which was a pair work. 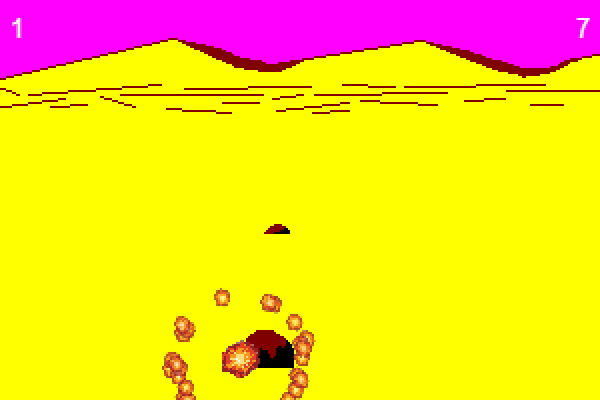 The game featured destructible terrain and some special weapons like a flak cannon to intercept incoming projectiles. We used RMI for networking, and the game ended up require a fair chunk of bandwidth. However, this was not a problem in the university network. Using the tried formula from Tykkipeli I coded the next project Avaruuspeli with an another friend. 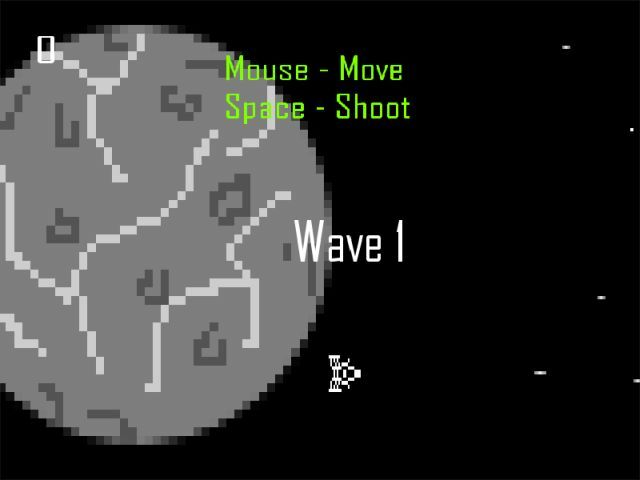 The game was a simple space war clone with two ships types. This time, we opted for a single player game and added a fuzzy-logic-based artificial intelligence. The project ended to be so extensive that we scored credits for two exercise projects at once. In a research seminar about game development, we had a larger group project. The participants formed two groups, and both were given same specifications for a game. We had to create a two player shooter game where the players could only move on rails. We ended up with two pretty different games. My team’s game HydraBlaster had a psychedelic theme. Neverwinter Nights was one of my favourite games at that time, and it came with a great editor and boasted great fan-made content. I made some mock-ups with the editor, but I did not make any complete modules. I was primarily interested in creating realistic day-night cycles and NPC behaviour because it feels stupid when merchants stand by their booth day and night without ever moving or city guards forgetting that you just killed someone in plain sight. Unreal III mod Tulevaisuuden Gladiaattorit 3000 or something like that. I can’t remember the name exactly. It was tough to get started on Unreal development. Fortunately, an expert from Ludocraft was there to help us. There were some slides about the collaboration between University of Turku and Turku University of Applied Sciences, but unfortunately, I can’t find them anymore.